Happy Tuesday, ladies!! Did everyone survive Thanksgiving and Black Friday? I don't know about you, but I have tons of leftovers from my Thanksgiving meal. One of my favorite leftover recipes is potato patties. Mix together all ingredients in a medium bowl. Over medium heat, heat olive oil in a medium size nonstick frying pan. Take about 1/4 cup of the potato mixture, pat it into 4 inch circles that are 1/2" thick and drop into the hot frying pan. Cook until bottom is browned and crisp, about 3-4 minutes. Carefully turn the patty over and cook the second side until brown and crisp, 3-4 minutes. I love potato pancakes but we never seem to have any leftover here at my house so I never make them. Maybe next time I will make extra just to make the leftover pancakes! All of our family took most of the leftovers home on a "to go" plate. We only had some ham and mac 'n cheese in or fridge. I make mashed potatoes every week so I can't wait to try out your potato patties. Thanks for hosting! I haven't had these in forever - I love these! I had leftover mashed potatoes, but I made added them to some bread dough. These sound yummy! I bet they'd be great with bacon and eggs for breakfast. These sound delicious! I'm always on the lookout for good ways to use leftover mashed potatoes! I made potato patties the other day. They are so wonderful. I just made a potato dish I wasn't so fond of tonight...wish I'd known about this one before dinner :) Thanks for hosting! We love Potato Patties, we actually made some with left overs. Thank you for sharing and hosting. Have a good week. I might need to make some mashed taters just to make thse! :) Thanks for hosting! yum, yum, and oh yeah, yum. excellent recipe! My husband loves potato pancakes but I needed a refresher in how to make them. Thank you so much for doing that!! Yay! Now I can create a diabetic friendly version for him...just a tweak here and there should do it. Your recipe sounds SO delicious! :D Yummy! Yum! I actually have some leftover potatoes in the fridge. Can't wait to try this one out!! These look like something you might want to serve in honor of Hanukkah! I love potato patties but have never added parmesan cheese before - what a great idea! Thanks for sharing it and for hosting. The potato patties sound awesome! Thanks! Thanks for hosting Tuesdays at the Table. It has been a while since I have made potato patties, your sound very good. Got to try your potato pancakes some time. Our leftovers didn't last long with all the growing boys here but those sound yummy. Glad to find your blog and link up! 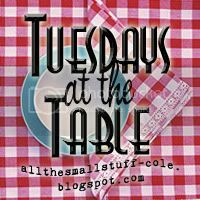 I am slow in making my rounds to visit Tuesday blogs this week!! Love, love potato pancakes. I love these, though like everyone else we never have leftover mashed potatoes. I'll have to remember to increase the next batch.